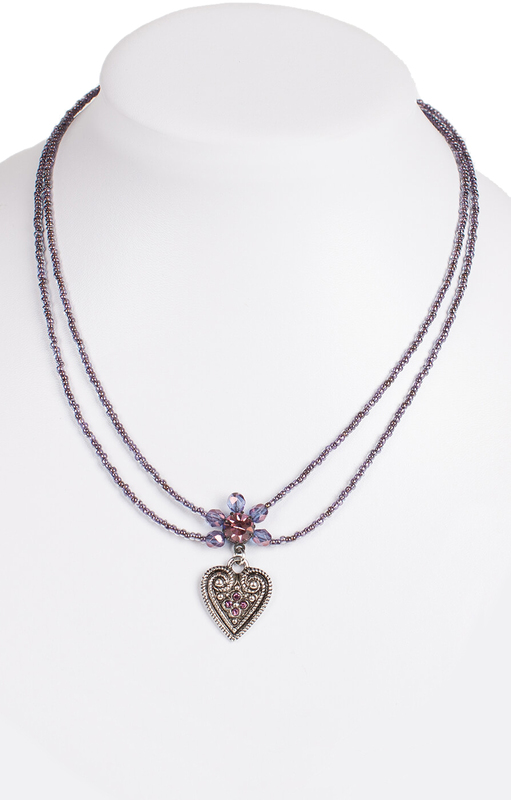 Shimmering bronze and plum necklace with heart pendant. This eye-catching traditional necklace in plum and bronze will pair off your Dirndl blouse splendidly at Oktoberfest. Two rows of short bronze, silver and translucent column beads join at the front. A nickel-free silver heart pendant features four small pink crystals. They glisten as the pendant dangles from the princess-style necklace. Holding the necklace together is a plum crystal charm surrounded by five faceted beads. Guter Service, gute Ware. Absolut empfehlenswert! Hübsch, solide verarbeitet, für den Preis sehr gut!